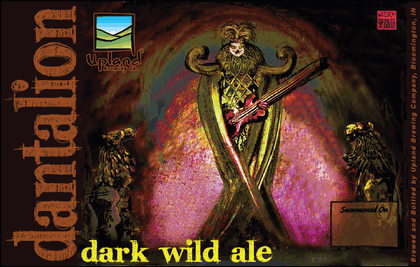 Dantalion Dark Wild Ale comes to us from Upland Brewing Co. in Bloomington, Indiana. A darker, perhaps more sinister take on the American Wild Ale than is normal. Brewed with dark candi sugar, spices, and a variety of beasties involving brettanomyces, lactobacillus, and anything else they might have snuck into a barrel that was left purposefully open for a bit. This beer pours black at first glance, but closer inspection reveals a muddy dark brown color, thick, high carbonation during the pour leaves some floaties fron the last third of the bottle. Not really distracting due to the dark color, and the high carbonation also makes for a very thick carpet of eggshell colored head that doesn’t go anywhere and leaves some very nice strands of lace swooping around the glass. The aroma reveals lactic sourness mixed with a milder, floral funkiness. Spice on the nose as well along with some strong esters, leather, and cranberries. Floral lotus-like barnyard funk defines the flavor, followed by lactic acid, coriander, crusty bread, and tart greens. Spots of diacetyl hint at a Flemish Red, but this is more floral and spicy. Moderately sour with a tart and bitter finish with twangs of roast and earth. What seems very carbonated during the pour fizzles out and becomes an exceptionally integrated and smooth carbonation reminding me of my favorite Flemish Red ales. While the bubbles feel amazing, the body is considerably thin for a dark wild ale. Overall this is a complex and tasty beer. I’d like to see it tweaked to include a touch more malt and body, and this could be an excellent beer. Looking forward to trying the next batch.